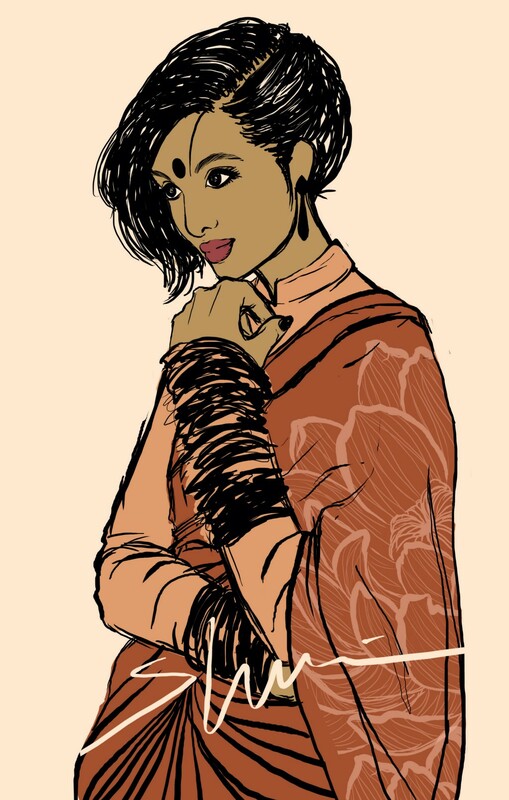 Our staff, artist, Shurmmi, creates gorgeous digital sketches that can be seen accompanying all the poems featured in this issue. She has been working hard and quickly over the past year and has recently launched merchandise featuring her artwork on RedBubble and Etsy. Her work relies on simple color palettes and rough strokes, which create almost effortless beauty. Shurmmi’s art sometimes strays into the highly traditional and contains gorgeous, meticulous details. 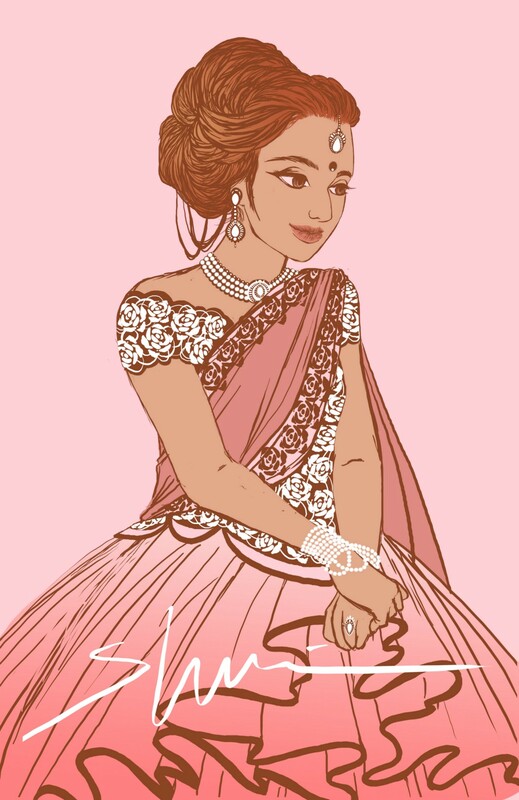 All of the pieces here, just a sampling of her 300+ portfolio, feature South Asian female faces. They are caught in longing, in dance, in dreaming, in frustration and pain. At the beginning of 2014 I gave myself a challenge to draw something everyday. I just recently graduated from the School of Visual Arts in New York City and I had a lot of questions. Drawing helps me think things out and leads to new ideas. When I started in January, every drawing was different. I was just trying to draw in as many different styles as I could. As time went on and my usual well of inspiration ran dry, I searched elsewhere. I was always looking far for something to spark my gears. I eventually found it, but it was right in front of me — it was my culture and it started nurturing my art. My drawings were more consistent with my culture and more fashion oriented. My goal with this challenge was to find which path to go on. I’ve always wanted to do a number of things, all art related, and it’s not a matter of what do I chose but what I do now. I definitely want to write a graphic novel one day, I’ve already written tons of stories. There are not enough Desi superheroes out there. I also really love fashion and I want to produce my own clothing line and be a fashion designer. I never built a safety net for myself, no day/stable job. For me it’s art or nothing. And yes it does seem stupid sometimes even to myself. This 365 drawing challenge has certainly brought me closer to achieving those dreams. Come 2015 I’m going to take the next step. Who knows maybe soon you’ll see comic characters, or new saris. Stay tuned because next year they won’t be dreams anymore.